Enjoy the winters with Team DFT with Greens Overload! 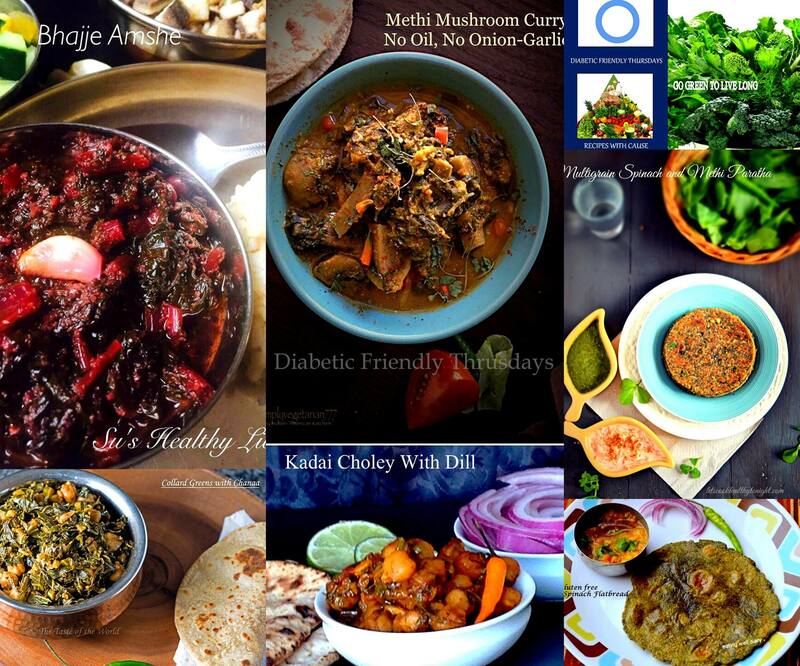 Bringing some hearty dishes with seasonal greens. 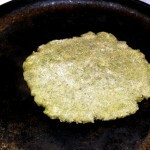 I have been trying to make the “perfect” gluten-free roti for the past year, making it as close to the “real” wheat roti. It is not easy to make a wheat-less flat bread; the absence of gluten as a binder makes it difficult to roll it out and most often than not, it turns out a little dry. I’m very thrilled with this recipe since most people that have tasted it think it is no different from a whole-wheat spinach roti. 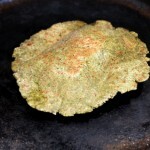 The greens give moisture and makes it look and taste very much like a regular green roti. It can even be stored for a few hours and still tastes fresh. 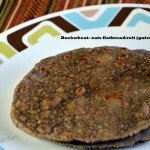 This flat bread is made diabetic friendly by the use of 80% whole grains (buckwheat and oats) in the dough. Since the base is spinach, excellent fiber and minerals are introduced that would make it even lower in glycemic index. Spinach has folate, iron, vitamin A and beneficial antioxidants, to name a few. 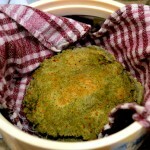 Earlier, I have posted a whole-wheat spinach roti with detailed pictorials. Refer to that post for a regular version of the flat bread. These are step-wise pictures with the gluten-free flour blend (see Ingredients). 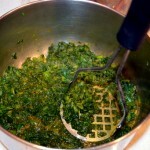 Spinach is cooked with spices and mashed with a potato masher. The greens are combined with the flours in a stand mixer, with water and a small amount of oil. The dough is allowed to rest for an hour. That time can be used to make a side dish for the meal. Cooking on a cast-iron skillet with minimal oil (a few drops are enough) following steps to make it fluff can give an excellent texture. Storing the flat bread by wrapping in cloth in a closed container is important to retain moisture. Additional oil or ghee can be used to smear the roti as needed. 1. Wash and chop spinach. Cook in a container till it wilts. 2. Add the above mentioned spices and cook further till it reduces in volume. Use a potato masher to mash. 3. 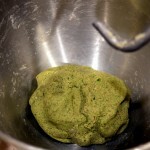 Combine the flours in a stand mixer, add the greens, 1 tbsp. oil. Mix on low speed adding water as necessary to form a moist dough. Alternatively, the dough can be kneaded by hand. 4. Keep dough in a covered container and let it rest for an hour. It can also be stored for up to 3 days in the fridge. 5. 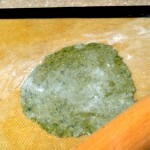 Use a silicone mat and additional buckwheat flour for rolling out the roti. Carefully remove it from the mat for flipping over, as it is not as easily rolled as a wheat roti. 6. Once rolled, immediately transfer to a heated skillet or store it covered with a lid. It can dry out easily. 7. Once a cast-iron skillet is heated well, heat one side of the flat bread. Use a ladle to flip and let the other side pick up heat. 8. Use a cloth or paper towel to gently press each portion of the flat bread to allow it to fluff. 9. Add a few drops of oil and let brown spots appear. Once cooked, wrap in cloth and transfer to a closed container. Serving suggestion: 2 rotis with a side dish such as dal. 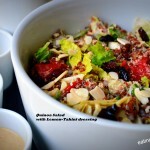 Sharing this at the Plant Based Link Up #71 at Urban Naturale. 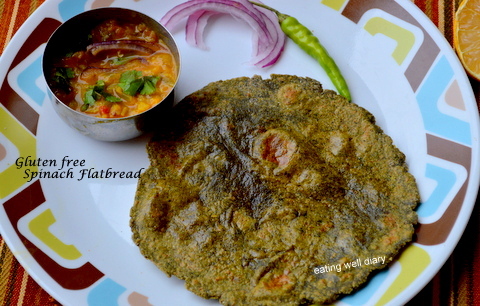 Pingback: Multi grain Spinach and Methi Roti – LET'S COOK HEALTHY TONIGHT! Thank you for your kind words, dear Swati. Fabulous Roti Apsara! I liked how you have used potato starch cleverly. Potatoes can be easily consumed by diabetics and when combined with spinach, their carb content gets reduced in net exchange :). Thanks, dear. I used to add mashed potatoes earlier in the roti and then realized that using the flour is so much easier! 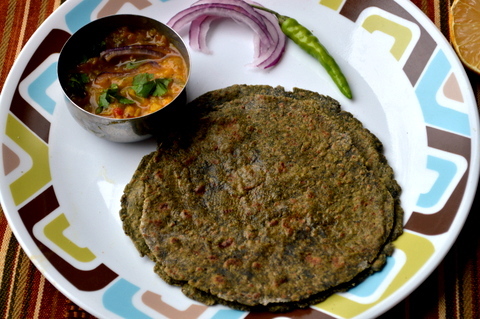 These rotis are oh so awesome Apsara and gluetn free wow…. Loved the use of potato starch .. 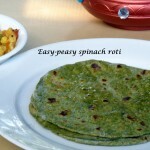 I am in love with these gluten-free, very healthy spinach rotis. They look so delectable. Thanks for sharing the recipe. Can I get away by skipping the potato starch in the roti? They do come out well; thank you, Suchitra. The starch is an important element in the flour without which rolling is very hard. You may be able to instead add mashed potatoes to the dough. I need natural products to reduce the sugar rate in the blood. Lovely share Apsara. 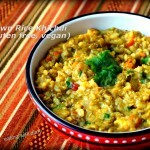 This gluten free roti is just awesome. Killing two birds with one stone, Diabetes and Gluten free. Thank you for the opportunity to link up in your blog, Deborah! So glad you like the post.